– Both zippered bags can be used as another resource for improvising. – The roadside kit’s zippered bag has reflective tape on it’s sides and can be used at night time in conjunction with the Reflective Warning Triangle. – The multi-tool is actually a knife that is similar to a Swiss Army Knife® with eleven different blades/tools, not to be confused with a Leatherman® or Gerber® multi-tool. 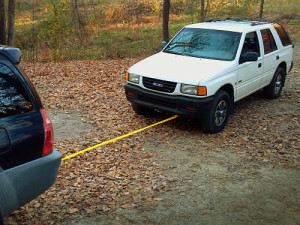 – Some items such as the towing strap can be stored in a seal-able plastic bag to keep contained and easily viewed for their use. – As illustrated in the photo, the towing strap actually works… adequate for pulling a vehicle out of a slick mud spot or across the yard but perhaps not for more vigorous towing. – Small roll of Duct tape, Notepad, Pencil/Pen, travelers tissues or toilet paper, flintwheel lighter, space blanket. 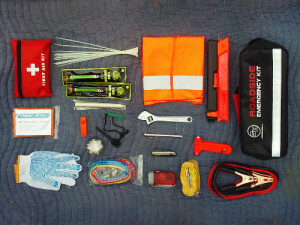 If you’ve ever tried to build an emergency kit or go-bag you probably noticed how expensive it is to buy it’s individual elements. In addition, finding an adequate container for it all can be a challenge and add to the expense. What amazes me is that all of the items listed above fits in such a compact package and for a very reasonable price. However I have wonderful news! 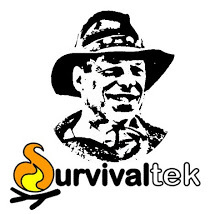 At the time of this review, Survival Hax has offered for my readers an incredible discount of $25.00 off of your order!! Normally my reviews are just for informational purposes but I consider this kit in conjunction with this discount offer to be an outstanding value. You may want to consider purchasing kits for all of your vehicles or as gifts for your loved-ones. This kit goes a long ways in helping you to be prepared for roadside or other unexpected emergencies. 3. Add the ‘Roadside Emergency Kit with Jumper Cables’ to your shopping cart and then checkout. This entry was tagged Emergency, Go-Bag, Improvise, Kit, Review, Survival Hax. Bookmark the permalink.